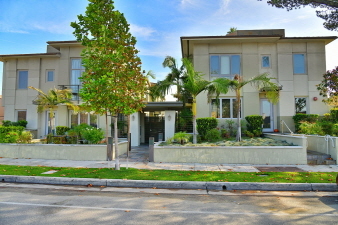 Interior Features Built in 2008 this lovely townhome is located in a gated community and is conveniently located near downtown LA, Pasadena Central Business District, The Paseo, Old Town, the Fillmore Gold Line station & easy access to the 110, 210 & 134 Freeways. Desirable end-unit in rear of complex offers additional windows and an abundance of natural southern light. There is a patio & side yard–perfect for pets. Features an open floor plan, new wood flooring, kitchen with granite counters & laundry in the unit. Master offers 2 closets (1 large walk-in) & master bath with luxurious spa tub. The downstairs is wheelchair friendly & there is a lift from the garage to the 1st floor. Direct access, 3-car garage with large storage room. The last sold units in the complex sold in 5 and 11 days – so don't wait!